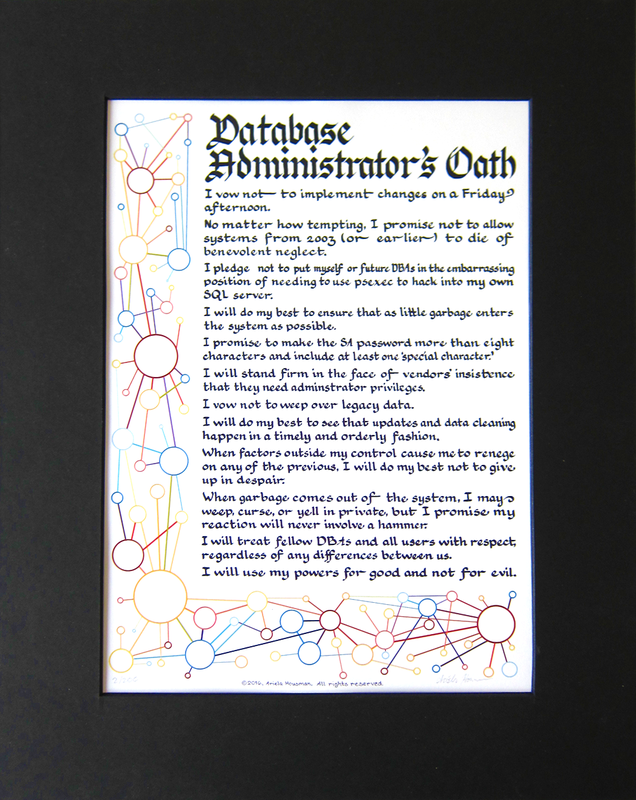 Demonstrate your all-encompassing database mastery with this oath on your cubicle wall. Ariela is all about logical next steps. We've done a Coder's Oath and a Sysadmin's Oath, so next up was a Database Administrator's Oath. We are getting further outside Ariela's zone of familiarity with this content. While she uses databases, she has not ever been and never hopes to be a DBA. So she consulted friends who are DBAs to compose the oath text. The circles are all primary colors, two shades of each, and are supposed to represent different kinds of data. The lines are all tertiary colors rather than secondary and are meant to represent different kinds of relationships. A line between a yellow circle and a blue circle will be in the green family, but it could be yellow-green or blue-green, depending on the relationship between the two data points. Ariela felt this was a more elegant solution than arrows, because relationships do go two ways, even if one datapoint is a daughter of another. *It is likely possible to backwards-engineer a data set that will fit the relationships portrayed here.